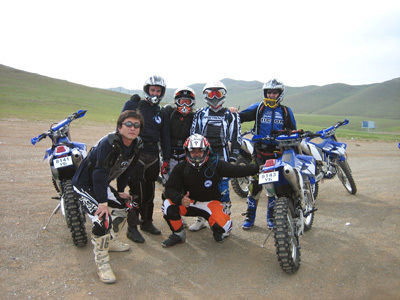 In summer 2008 I had the pleasure of travelling across Mongolia from the Gobi Desert right up to the Siberian border with a bunch of enthusiastic off-roaders of various origin. 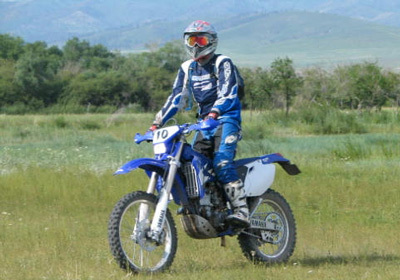 We used Yamaha WR 250F bikes provided by Bike Mongolia, who also supplied Force 10 tents, support vehicles (who struggled to keep up with the bikes), delicious food served in style by a beautiful Mongolian cook, and to cap it all a professional medical physician (ex Mongolian army motorcycle corps) who massaged and cared for us the whole trip. 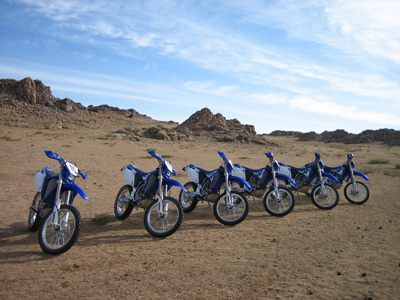 The bikes were excellent - very light and great fun on all road conditions - sandy desert, rocky mountains, rivers, mud and potholed jeep tracks. 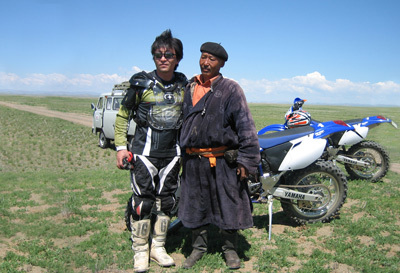 Everyone had all the right protective kit and I have a lovely photo of an old Mongolian chap in traditional "del" robe posing with one of the Korean motorcylists who looked as if he had come from Mars. Some people in the group were more interested in the culture of the country than others and one in particular took every opportunity to divert from the trail and call in at every nomads' ger we passed to brighten up their day and share sweets and baloons amongst the children. It was the same English bloke who at one point lay down his bike and jumped on a yak to see how it handled. 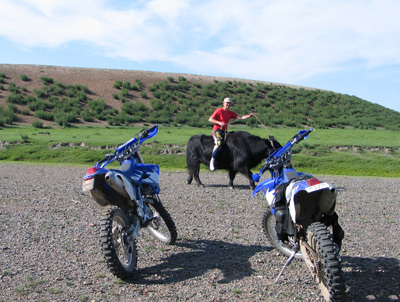 In Mongolia, people ride the yaks and milk the horses, you see. We camped in some spectacular places, usually near a river which had loads of fish in, but no means of catching them unfortunately. Sometimes we stayed in ger camps which are just like the round white yurts that the nomads live in, but with posher furniture. That was quite a treat because there were hot showers and cold beer at the camp. We did 2000km in 11 days and by the end of it everyone was pretty exhausted. However, no one would deny it was the trip of a lifetime. Mongolia is such a fantastic country - there's endless space, sometimes you can see more than 50km in every direction. We travelled for days without seeing a single building, which was such a joy, especially for those coming from the cities of Beijing, Seoul and London. Most people know very little about Mongolia and guess that it is all vast open steppe, rather more sandy perhaps in the Gobi Desert. But actually the countryside is really varied with volcanos, canyons, big sand dunes, forested mountains and rolling green hills. The nomadic lifestyle seems to have changed little since the days of Genghis Khan and the people are so hospitable. I suppose their lives must be pretty uneventful normally, so when a crowd of foreigners and city Mongolians appeared out of the blue, we were welcomed with open arms and lavished with offerings of yoghurt, rock hard cheese, fermented mare's milk and milk vodka. If you want to experience something really wild, go for this. At the moment Mongolia's infrastructure is in the development stage and getting there in the first place requires some effort, so for these very reasons you will see a place unspoiled by tourism and quite literally off the beaten track.